Sad time for Trojan fans. 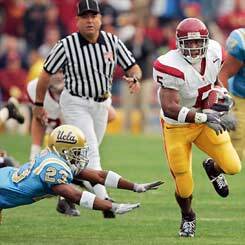 Does USC stand for Unequalled Sports Cheaters? What a joy it was to watch USC football. The lightning-speed acrobatics of Reggie Bush. The instinctive pursuit of Brian Cushing. The hard hitting of Kevin Ellison. The exuberance of Pete Carroll. The elusiveness ­­­of Joe McKnight. So maybe the basketball program was corrupt, what with the underhanded payments to O. J. Mayo, the sneaking out of town by coach Tim Floyd, and the forfeiting of an entire season. Not good, but Trojan football! There was something to believe in. Yes, there was the repeated taunting, showing off, and poor sportsmanship . There was the rub it in last minute touchdown pass en route to a pasting of UCLA. There was the suspicious ownership of a new car driven by Joe McKnight. But we never believed the charges of illegal payments to Reggie Bush’s parents, charges made by unsavory characters against All-American Reggie. Now we’re rethinking the Bush situation, now that Brian Cushing, star linebacker for the Trojans before becoming the NFL defensive rookie of the year, was suspended for 2010’s first four games for using banned “performance-enhancing substances.” And now that former Trojan safety Kevin Ellison has been pulled over for speeding in a school zone, then arrested for possession of 100 Vicodin tablets. With so much wrongdoing involving Trojan footballers, why not believe Saint Reggie was corrupt too. Especially with USC’s stonewalling and refusal to comment on the charges, especially with the NCAA taking months after a hearing to render a verdict. They wouldn’t be taking so long unless there was something to the charges. Look for the Trojans to forfeit a football season and a national championship. Something is rotten in USC athletics. Including football Makes it hard for a life-long Trojan fan to root for them much longer. We wonder if the new USC president and the new football coach will clean up the mess. This entry was posted on May 25, 2010 at 8:39 pm and is filed under Education, Ethics-general, Sports. You can follow any responses to this entry through the RSS 2.0 feed. You can leave a response, or trackback from your own site. Quite possibly the most loaded and poorly written article I’ve yet to come across. This is, at best, a thinly veiled hatchet job and at worst, a blistering incitement of the American educational system. Thank you. I meant it to be an indictment, but I didn’t mean it to be thinly veiled–not veiled at all. It’s especially sad when USC fans approve their own team’s cheating, just like it’s sad when Democrats approve (or defend) Blumenthal’s lies, or Republicans approve McCain’s flip-flop on immigration reform. You are so dense, you don’t even realize the critique about the indictment of our educational system was aimed towards you and this poorly written piece of drivel. This is very interesting, mostly because it exposes something about the author. For someone that talks about ethics and integrity, you yourself prove to lack abit with this piece. You call in to question about USC’s Athletics ethics. The problem is, in your examples you site two individuals who may have done something after they have long left the school. You also mention Joe McKnight’s situation incident, which appears to have proven to be absolutely nothing. We’ll know more shortly. And we are still waiting the Reggie Bush results. Surely you could have come up with better proven examples than these. As for the poor sportsmanship with the last minute touchdown pass vs. UCLA, well……..did you even watch the game? Were you aware the previous play USC in a show of mercy kneeled down to run out the clock? UCLA wanted nothing of it and starting calling time outs to play on. Is that the integrity you admire, or the UCLA coaches afterwards leading their team out to mid-field for a confrontation? I think you are either a hated rival of the school or trying to pump some agenda. My guess is both. You must have some books or consultant jobs you wish to pump up some energy for. My advice is that you should probably so some research beforehand. Surely you can do better. The monkeys at the top of the page could. This article is an over kill. Actions of a few does not equate to cheaters. Ellison is one of a thousand fb players to be arrested for speeding and Rey one of long line in this country to enter rehab. Players far more famous than he have done that. Cushing judgment is not in, but whatever was his decision not USC. McKnight was nothing but a warning you have to be careful even when driving your girlfriends car. Bush was bad, but it was last thing USC would have wanted. It took no part. At most, they had no sufficient dillegence plan. Pete Carroll had no background for this. As to Mayo USC did participate and the coach should have been banned from college BB. They all knew Guillroy was scum. But fact is all this and more has gone on at Alabama, Florida, Florida ST, Miami (in SEC they have to check in guns), Oregon, UCLA and you name it. It is a problem of youth and individual character. As to when players turn pro, too much money for too young, in all sports. As argued in Animal House, but here no joke, its all over the games themselves and an indictment of the insuffficient system in place. Keven Ellison had Vicodine pills. What is surprise. He is playing in NFL. Paul, I agree with a lot of what you write. I think we part over responsibility.There’s so much going on that USC can’t say “It’s not our fault.” They are responsible for what their players do. There’s bad stuff going on in the SEC, too, but it especially hurts me when MY team does wrong. I’ve made several posts admiring how Chip Kelly, Oregon’s FB coach, has been handling bad actors. I wish USC would do the same. And while they’re at it, how about removing the number 32 jersey from the peristyle end of the Coliseum. Why honor OJ? He won the Heisman, but we don’t have to honor him for it. Pablo–Actually your long-distance psychoanalysis is off the mark. I’ve been a USC fan since the late 1940s. I WAS at the UCLA game, excited about the decisive win, until the unsportsmanlike ending. The last TD sucked all the excitement out of the day for me. I’m sad to have to say there’s a pattern in all of the incidents, and it’s a pattern an ethical person would have a tough time overlooking. I hope I’m wrong about Reggie, and I hope Kiffen and the new USC administration show a commitment to sportsmanship. Also, I hope you’ll read my book, “THE ETHICS CHALLENGE.” If you’d like I’ll send you a sample chapter. You say you’re a USC fan but can’t spell the coach’s name correctly. You try to say there’s a pattern but the examples you used are all unproven or of people who may have committed things after they left the school. How is again is the school supposed to monitor that? Lastly, you try and pimp out your book EXACTLY as I speculated your agenda might be. Now with your reply, I’d say it was a dead-on BULLSEYE. As for your book, if it resembles anything of the tripe from your article here, I don’t think anybody could stomach a small portion of it. Best of luck anyways, please go psychoanalyze yourself. Great time to be a Trojan! 2 National Championships in the last 2 weeks! I find it very hard to accept the connection between USC and Brian Cushing’s decision to use performance-enhancing drugs. First, that is his decision. USC has no right to bar him from making that choice, if it’s what he chooses to do. Second, USC has drug tests for all of its athletes. As a member of the USC Track and Field team from 2003-2005, I can tell you that for a fact. Cushing never failed a test while at SC; if he failed a test AFTER he graduated from USC, how is it then USC’s fault? I don’t see the logic. Even worse is the “connection” you make between USC and Kevin Ellison. If he received Vicodin from USC trainers, THEN there might be a rational argument. However, there is no evidence of that. To then make the assumption that USC is rotten while citing this as an example is completely irresponsible. It seems very clear that while you may have been at the game, Bob, you were not watching the final 2 minutes. As stated earlier, SC was very willing to run the clock out. UCLA wanted to keep playing. Is it so bad that USC took it upon itself to run a play that was there for the taking? UCLA had 9 guys in the box. Why would SC call a running play into that? All UCLA was going to do was call a time-out anyway. So you’re saying it’s okay for them to keep playing all-out, 100%, while SC has to tone it down? Sorry, that’s not how football works. You play hard or you get hurt. UCLA made it clear they wanted to keep playing – we obliged. Interesting that you choose to discuss sportsmanship and the UCLA game, when the Bruins swaggered more than half-way towards our sideline, knocking over a referee while doing so. That’s okay in your book, but it was wrong for SC to call a wide-open play during the game? I think you need to re-evaluate your logic when discussing USC and “cheating.” You also need to think about “ethics” and college football in general – you cite your admiration of Chip Kelly, when in actuality he has a gigantic double-standard. If you’re a scrub and you get in trouble, you get kicked off the team. If you’re a starter or significant contributor, let’s wait and see what happens. The only reason Masoli was suspended for a year is because he pled guilty in court (and the suspension was handed down AFTER he pled guilty). Look up the players, cases, and punishments. We won’t even go into the stuff that’s happened at Florida over the past few years. Your inability to step back and see the full picture is a little frustrating. I’m sorry Bob, but you need much better examples and evidence to support your stance. I understand the frustration that comes with bad press. However, nothing that you’ve cited here is compelling enough to change minds. That may not be your goal, but if you want people to buy your book it’ll take more than advertising this link on SC websites. Thanks for your thoughtful comments. I’m glad to learn that USC has drug tests for all its athletes, and I know I can’t blame the university for what athletes do, whether in school or after they leave. But all of them, Cushing, Ellison, Bush, ethics al, reflect on USC. Just as Princeton can be proud of three Justices, USC can be proud of its graduates, many of whom I admire and count as friends. But they can’t be very proud of the misbehaving ex-footballers. And they shouldn’t be proud of all the taunting, late hits, and unsportsmanlike conduct the Trojans have been penalized for in the past few years. I was at the UCLA game until the end. When the Trojans scored the last touchdown I was stunned, and my glee over the win turned sour. UCLA was justified to call the timeout—it theoretically gave them a tiny chance to score two touchdowns. Had Barkley taken a knee twice the game would have been iced. The long pass was rubbing it in. C’mon, you can see that. Regarding Kelly and Oregon, I’ll just respectfully disagree with you. He has handled bad behaviors instinctively, firmly, and kindly, and in ways that weighed against future success on the field. Believe me, my expectation wasn’t to sell books to USC fans who are angry at me. I only mentioned the book in response to a comment. My hope in writing the piece was (is) to encourage other USC fans to expect and demand ethical behavior from the teams, coaches, and administrators. Interesting points, but if you are going to ‘blog’, then take a writing course. Your composition needs some work. This morning I viewing an article from this sports journalist named Mike Florio, I think he covers football for Profootballtalk.com. He’s striving to make the arguement for why Reggie Bush and Pete Carroll must be penalized in some form, for what they did throughout their tenure at University of SoCal. Personally I don’t sense Reggie Bush must be punished in any fashion whatsoever, as the student athlete that he was, I need to feel that he simply did what he was told to do, or given the “green light” to accomplish, by his superiors. I sense that the majority of the blame need to be given to Pete Carroll along with the athletic director. The ones that I experience most sorry for are Lane Kiffin and the current roster of players. These poor guys are going to have put up with the full repercussions for the actions of their predecessors. As for stripping away the Heisman title that Bush won, I sense that’s utter nonesense. He won that award, his on the field capabilities and being the very best college player for that period.